Micro-scale digestion is, with some exceptions, a continuous process based on manure. Bacteria that already live in the manure degrades organic material and convert plant residues into biogas. The basis of the biogas installation is the digester, which mostly consists of one or more gas tide manure storage tanks. Below you can find more information on digester techniques, different components of a biogas installation and get to know more on the biology and process parameters in digestion. Micro-scale digestion is, with some exceptions, a continuous process based on liquid manure. The basis of the biogas installation is the digester, which mostly consists of one or more gas tide manure storage tanks. The liquid manure in the digester is mixed or stirred and kept at a constant warm temperature. The substrate is fed in the digester several times a day. Digestate is taken out of the digester concurrently. The content of the digester is constant, which results in a smooth and continuous biogas production. The Organic Dry Matter (ODM) Load is well controllable and the feeding installation can easily be automated. You can choose a vertical or horizontal digester, single stage or multi stage, mesophilic or thermophilic et cetera. Which installation is best for you, depends heavily on the substrate mix that you want to use. For solid manure there are several options; when mixed with liquid manure or water it can be treated like liquid manure in systems described above. Another option is a batch process for example with a the box type digester. A box type digester usually consists of multiple boxes, which are filled to the maximum, after which the digestion process takes place. When the retention time has elapsed, the box is emptied and the process starts again with new substrate. The liquid which escapes during emptying (percolate) is captured, heated and sprinkled over the new substrate. Another digester type is more common: the plug flow fermenter. This is a horizontal cylinder where the substrate moves in a plug from one side to the other. The stirring mechanism works perpendicular to the direction of that movement. The ODM-load of a plug flow reactor can be higher than that of a continuously stirred vertical reactor. Values of 5 up to 10 kg ODM/m3/day are typical. In practice, this type of digesters are often combined with a vertical digester, allowing longer retention times. Which components are relevant for your case and what capacities are needed depends on what you want to produce (energy or gas), what possibilities you have for purchasing co-substrates, the treatment of digestate, et cetera. 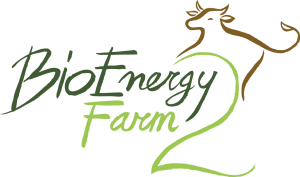 Biogas is produced out of biomass through a biological phenomenon: anaerobic digestion. Anaerobic means that the process takes place in an oxygen-free environment. The organic material in the substrates is reduced and converted to biogas by micro-organisms. In the first phase, hydrolysis, large organic polymers such as carbohydrates, fats and proteins are broken down into smaller constituents, like simple sugars, amino acids, fatty acids and water. Thereafter, the second phase starts. That is acidogenesis, the further breakdown of remaining components. It is done by the acidogenic bacteria which convert the material into short-chained fatty acids, alcohols, CO2, hydrogen and ammonia. During the third phase, acetogenesis, the organic acids are formed. They are the basis for the eventual methanogenesis. The bacteria responsible for the third phase, the acetogens are highly sensitive to temperature fluctuations. The methanogenesis itself also slowly starts during the third phase. The fourth and final stage of digestion results in methane production. Ninety per cent of the total amount of methane is formed during this phase. Also CO2 is released and, in small proportions, also water, H2S and N2. The content of methane in biogas typically varies between 50% and 60%. In micro sale digestion the four stages of digestion typically take place is the same reactor/digester which is continuously stirred. The bacteria in the digester are very sensitive to temperature. For that reason, the temperature of the fermenter has to be kept at a certain level in order to prevent the bacteria from being killed. In practice, a division is made between mesophilic bacteria and thermophilic bacteria. Mesophilic bacteria require temperature between 25°C and 45°C, typically approximately 38°C. For thermophilic bacteria, temperature of 45°C or more is required. Thermophilic bacteria are more sensitive to temperature changes than mesophilic bacteria. For that reason, thermophiilc digestion is more difficult to control. A humid environment. The water content of the substrate should be at least 50% for the methane building bacteria to work and to reproduce themselves. A dark environment. Although light is not lethal for the bacteria, it does slow the process down. So creating a dark environment supports the digestion process. The pH-value in the digester. Generally, each bacteria colony operates optimally at a certain pH-level. For the methanogens, this is 7. In case of single-stage digestion, where just one fermenter is used, it is recommended to maintain this pH-level. This is because the methanogens takes most time to reproduce, what makes them the weakest chain. Nutrients. To build up cell material, bacteria need nutrients, vitamins and minerals. Manure generally provides sufficient nutrients, vitamins and minerals. Large surface of substrates. The finer the substrates are when they enter the fermenter, the larger the specific surface area, and the better the digestion process will develop. Especially when the retention time is short, it is important to use a very fine grind of the substrates. Formation of floating layers decreases the active surface, what is one of the reasons for frequent mixing of the substrate. Continuous feed of substrates. To prevent the bacteria from being overfed, it is important to create a substrate flow which is as continuous as possible. The better degradable the substrates are, the more often they have to be fed in the fermenter tank. Gas outlet. The easier the biogas can escape from the substrate, the higher the production will be. To accomplish that, the gas pressure above the substrates should not become too high. A good gas outlet is therefore necessary. Avoidance of disturbing substances. Some substances have a disturbing or even devastating effect on the biogas production. Oxygen is a good example, but also antibiotics or mouldy substrates can disturb the digestion process. ODM-load, which stands for Organic Dry Matter load. This represents how many kilograms of ODM per m3 fermenter volume per day is being fed into the digester. Typically, values are between 2 to 3 kg ODM/m3/day. As a rule of thumb, you can take 4 kg/m3/day as a maximum value. Above that, the activity of the bacteria diminishes. Retention time. The so called hydraulic retention time is the theoretical duration that the substrate stays in the fermenter. For a continuously stirred vertical fermenter, this is a calculated value. For a plug flow fermenter, the hydraulic retention time represents the actual retention time quite accurately. Generally, the easier a substrate can be broken down, the shorter the hydraulic retention time can be. Degradation percentage. This reflects the percentage of the total amount of Organic Dry Matter which is broken down during the retention time. Typically, this is approximately 60%. More is possible, but one would require a considerable longer retention time and/or thermo-pressure treatment. In practice, a total conversion of all ODM is not realised.